The Vegan Edge with Stacy Alexander: Its Vegan Muffin Time! ...and they're GOOD!!! Its Vegan Muffin Time! ...and they're GOOD!!! 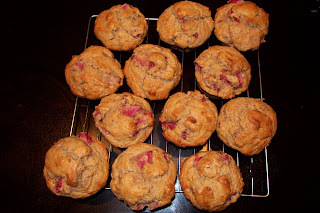 I find that it is incredibly simple to use egg replacer and soy or almond milk to make egg-free and dairy-free vegan muffins, and no one ever complains about the substitutions. They vanish just as quickly as the ones made with dairy products. Pre-heat oven to 350 degrees and grease or line a muffin tin. Beat together the bananas ( I let them get really soft and overripe first) , brown sugar, egg replacer, vanilla bean or extract and vegan margarine. In a separate bowl, combine together the flour, baking powder and baking soda, nutmeg, cinnamon and salt. Add to the banana mixture and stir just until combined. Gently fold in the strawberries. Fill each muffin about 2/3 full with batter. Bake for 20 - 25 minutes, or until an inserted toothpick comes out clean. This is both a sweet and tart muffin recipe, chock full of zesty lemon flavor - just the way lemon poppy seed muffins should be! 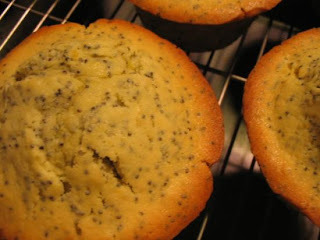 Be sure to use a vegan margarine when making this vegan lemon poppy seed muffin recipe. Pre-heat oven to 375 degrees. Grease or line a muffin pan. In a large bowl, combine the flour, baking powder and salt. In a separate small bowl, whisk together then lemon juice, soy milk and vanilla. Add the margarine and sugar, then add the egg replacer. Stir in the lemon zest and poppy seeds. Gently combine the flour mixture with the soy milk and margarine mixture just until mixed. Pour into prepared muffin pan. For extra sweet muffins, sprinkle the top of each muffin with a pinch of extra sugar. Bake for 20 - 25 minutes, or until a toothpick inserted into a muffin comes out clean. Ta daaaaaa! Vegan muffin goodness!